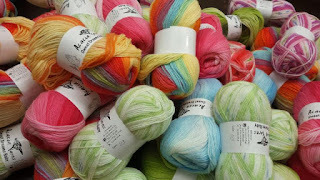 Whats happening at the Yarn and Fiber Company today? Our customers, our projects, and who is visiting the store this week! Thank you to everyone who showed up at our first full fashion show, featuring the garments from the Twist Collective August and November (Fall and Winter) issues, and a special thanks to Julia from Twist and Cyndi for a fabulous commentary, and many many thanks to all our volunteer models. The video is now available on our website and on YouTube, this can be found at http://www.yarnandfiber.com/catalog/videos.php. The video is in three parts, parts 1 through 3. The quality is somewhat limited by being on-line but gives an idea of how the garments look on real people. High quality photos of the garments are available at The Twist Collective website. Please note that when viewed on our website the video playback is in "High Resolution", it can be played in "Normal Resolution" on YouTube. Videos should playback on all computers, but if you have difficulty please drop me an email at support@yarnandfiber.com. A complete fiber addict who loves it all! Knitter, crocheter, spinner, weaver, quilter and hand-dyer! Oh, crazy yarn shop chick too! And loving every second of it! Thanks Jerry!